To quote from Wellcraft's website, "For more than 50 years, we've held fast to the promise of crafting a great American icon." Wellcraft®, one of the oldest names in fibreglass boat building and renowned for its iconic Scarab® brand of offshore high performance boats, is part of the Rec Boat Holdings group of companies of Cadillac, Michigan. 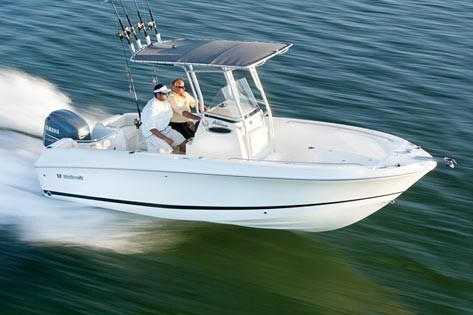 For 2012, Wellcraft offers sixteen models in four series from eighteen to thirty-five feet. 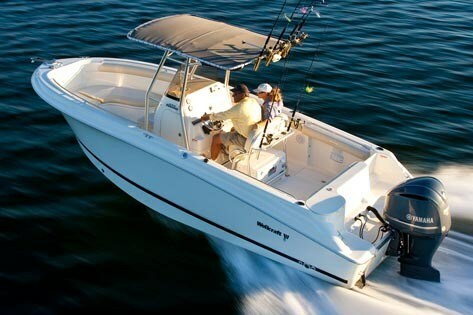 The 252 Fisherman, the "granddaddy" of Wellcraft's four models in this series is also the largest in the series which starts at eighteen feet. The 252 Fisherman is constructed and supported with a fibreglass, box section stringer system which is foam filled for rigidity and flotation and unlike many others, has an integral high density composite transom construction. This transom extends full height and level with the top of the gunnels but provides a starboard-side door for easy access to the integrated swim platform with boarding ladder. A convenient entry light switch is provided here for afterhours boarding. Up front, an anchor rope locker with hawse pipe leads to a deck mounted anchor roller with anchoring cleat. Two huge bow side lockable storage compartments can be fitted with optional bow cushions and side bolsters for seating. Additional optional bow seating can be had with a handy 94-quart cooler seat with seat back and bottom cushions which fits neatly ahead of the console. Standard integrated stainless steel side grab rails are fitted on both sides of the bow as well as the stern cockpit areas. Additional seating is provided with a cushioned fold away rear bench seat with aft bolster. A two-person helm seat can be individually converted from the seating position to a leaning post standing position. Below this seat is a large 94-quart removable cooler. Two vertical rod holders and a pair of drink holders as well as a "poly prep station" are mounted behind this helm seat. The full inner fibreglass lined console has a lockable entry door on the port side and an opening port light with screen on the starboard side. A self-contained head is standard but will require deck plumbing for pumping out. Mid-ship battery storage is found below the deck of this console. The helm itself offers full digital outboard motor instrumentation, a compass, and a powered buss bar for your choice of optional electronics. Lots of space is available on the facing surface of the helm to mount virtually anything you would ever need in the way of electronics on a boat this size. Steering is hydraulic through a stainless steel tilt wheel with "power knob." Trim tabs are standard equipment. The T-top with four rod holders, outrigger plates, spreader light and pfd storage is standard. A three-sided canvas enclosure for the T-top is optional. A curved plexiglass windscreen provides protection for the driver and passenger. Fishermen will find lots of goodies on board the 252 Fisherman to enhance their activities. First off is an 84-quart baitwell with a light and overboard drain. Two 180-quart fish boxes with overboard drain and sealed lids are located in the bow and another two fish boxes with overboard pumpout are located in the stern. Two tackle storage boxes with removable trays are also standard. Additional horizontal rod storage is found under the gunwales on both side of the boat. Raw water washdown is standard; a pressurized fresh water system with transom shower is optional. Additional mid-cockpit tilt-out storage bins on each side of the boat are available. Single 250 or 300 horsepower or twin 150 horsepower outboard motors from Mercury, Evinrude, or Yamaha are offered for the 252 Fisherman. Factory supplied performance specs with a single 300 hp F300 four stroke Yamaha indicate the most efficient cruising speed to be just below 30 mph at 3500 RPM while consuming 8.7 (US) gallons per hour and achieving 3.3 (US) miles per gallon. Range at this speed is 493 miles. Full throttle 5500 RPM provides just over 50 mph while consuming over 25 (US) gallons per hour. 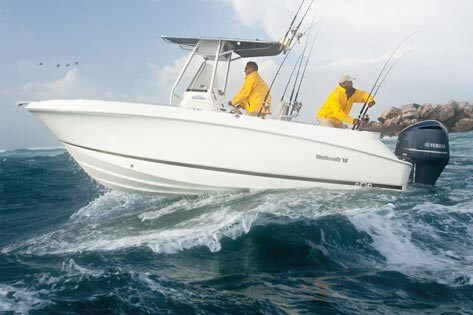 In Wellcraft's words, with a 252 Fisherman, "You'll find yourself spending all your best time on the water!"